There is something about a unique sound experience that can pep up the worst of your weekdays. At Sennheiser, you can trust the quality to give you absolutely pristine sound effects without distortions. It is not for nothing that they have been a leading name in the music industry for the last 70 years. At its features and its advantages over competition so that you know what to choose for your next event. Whether you are a male or a female lead singer, the Sennheiser e935 will suit your voice without any issue. While being both powerful and unpretentious, it is an inexpensive handheld microphone that will not burn a hole in your pocket. The sound that it produces is beautifully balanced and gives you the quality of a condenser mic; a combination that lead singers absolutely love. Despite being a cardioid microphone, it sounds more natural that its supercardioid counterparts. If you are a versatile singer, catering to karaoke, jazz clubs as well as peaceful house parties, this mic will blow your mind with its incredible range. Lead singers usually don’t need to worry about the bleed, which is precisely why the microphone is your best bet. The Sennheiser e935 will not give you sudden bumps while you are up on stage delivering your best. Its frequency pattern is well-crafted with a reasonable boost and a great base roll off that will make transitions sound as natural as they could ever be. With perfectly balanced brightness, quintessential to a live performance, this microphone conveniently cuts through the mix and will let the harshness of the condensers reach your ears. While continuing to offer great transient response along with unmatched detail and clarity, e935 is rather smooth. To begin with, the e935 can work under all weather conditions, whether favorable or unfavorable and is a reliable tool for the perfectionist in you. Weighing around 330 grams, it could be considered longer and heavier but with its rugged metal design and a firm grip, it undoubtedly proves its durability. To back up its promise of performance and durability, Sennheiser offers a 10-year warranty that makes this product even more popular. The microphone has a high level of feedback rejection while its humbucking coil ensures maximum cancellation of interference. To add to these features, its capsule mounting is shock-resistant and further helps in minimization of handling noise. It is generally believed that a microphone needs to be individually chosen because every voice has a unique suitability. This is what makes the Sennheiser e935 stand out among its competitors. It has a sweet spot, it is easy to handle and works for all kinds of voices. Whether you are buying it for your own deep baritones or your co-singer’s high-pitched voice or even your 12 year old stage enthusiast; this microphone will never fail to amaze you. The e935 belongs to a completely different league of microphones, in the sense that, you can actually improve your own voice and performance with the help of it. Sounds impossible, right? 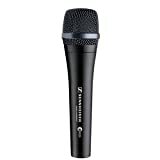 With this microphone, your voice will stand out clear and bright and all your flaws in the singing will show up. Instead of merging your voice with the background tracks, the microphone will highlight the flaws so that you can better your performance on any given day. The microphone weighs around 12.5 ounces and its dimensions are 10*3.5*5 inches. It does seem heavier and longer than its counterparts but it also means that it is built to last. With the firm grip and heavy build, there is no doubt that the microphone will be highly durable and will never fail to impress you. This is a common issue that is picked up time and again whenever the product is reviewed because not many people are used to sensitive mics. There are two things to be considered here; the first that you would need discipline while handling the mic. Singers could face the issue of plosive sounds coming through if they are not careful while positioning the mic. These are all possible disadvantages of a mic that is highly sensitive and requires re-training oneself to be able to use it without any trouble. How is the Sennheiser e935 better than its competitors? While being heavier and longer than its competitor, SM58, the e935 is any day a more durable and safer option. Weighing a good 12.5 ounces, it has been designed to last long. Along with the weight, the microphone is also made of rugged metal that can work under all weather conditions, owing to the neodymium ferrous magnet with boron. In a market full of microphones, you will often need to test your voice with the mic to find the perfect match. This is because not all microphones will suit your voice and pitch. The Sennheiser e935 is built in a way so as to suit all kinds of voices. How many microphones in the market cater to a diverse array of users – from deep baritones to young children? This microphone is basically the everyman microphone. If you have a great voice, chances are you should be singing into this mic! What you could possibly look at as a disadvantage is in reality a great advantage to work with. The mic is highly sensitive and will require re-training yourself to work with it. This could mean more work for people who expect a prepared mic to use. It also means that you will hear your own voice loud and clear, unlike the Shure SM58 that tends to subdue and merge your voice. This further means that you will be able to identify the flaws in your singing much more efficiently than other microphones because your voice will stand out from the background music tracks. You have every scope of improvement with this microphone at hand. Having discussed the advantages and the disadvantages of the microphone, it is clear that this is indeed a versatile piece of equipment to carry along on your musical journeys. The Sennheiser e935 is best suited for lead singers who need great voice clarity and are also looking forward to improving their overall stage performance. Get the best vocal mic from this TOP 5 list! 3 How is the Sennheiser e935 better than its competitors?